Composting is a way to use our food waste as a renewable resource that returns “vital nutrients back to the soil, to nourish the earth and green our City.” In essence, composting creates the soil we need to grow our food and support life itself. New York City recently launched pilot composting programs, which have proved so successful in participation that in June, the Bloomberg administration unveiled an ambitious plant to collect food scraps across the city and has hired a composting plant to convert 100,000 tons—about 10 percent of the city’s residential food waste—into compost. The program will be voluntary in the beginning, but according to a recent New York Times story, officials predict the program will be mandatory, perhaps as soon as 2016. Campos Community Garden already composts in several ways—it has a large open bin for leaves, grass, and other yard waste. We have a Bokashi system started last fall after Hurricane Sandy to ferment food waste to use to restore the soil damaged by the store (we’ll tell you more about that process in an upcoming post). 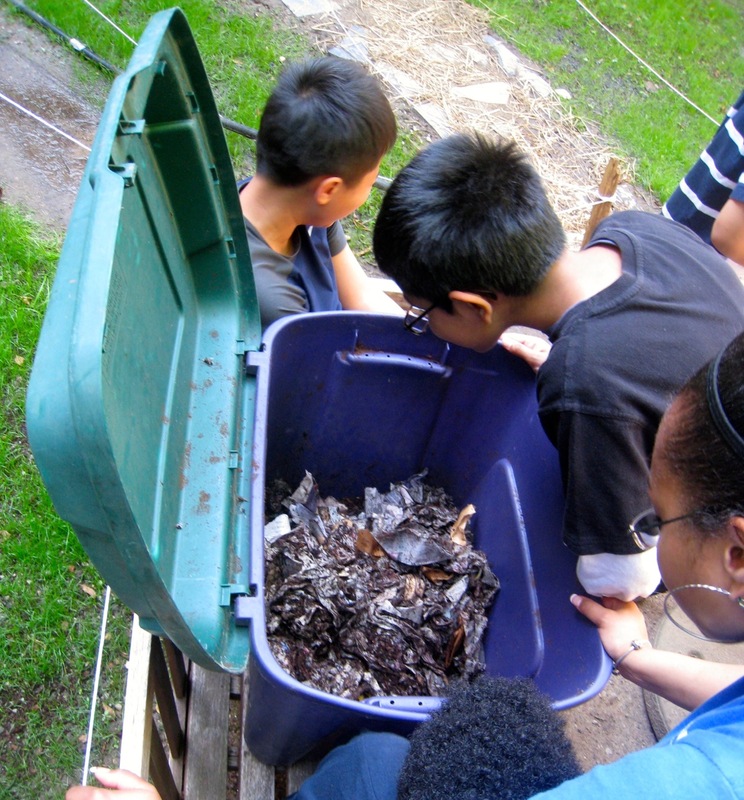 And now, thanks to the Boys Club of New York, we are also hosting their worm bin composting system at the garden. Worm composting, also called vermicomposting, is the process of breaking down food waste into compost using worms. Worms eat food scraps, which become compost as they pass through the worm’s body and become waste. Compost exits the worm through it’s tail end. This compost can then be used to grow plants. To understand why vermicompost is good for plants, remember that the worms are eating nutrient-rich fruit and vegetable scraps, and turning them into nutrient-rich compost. 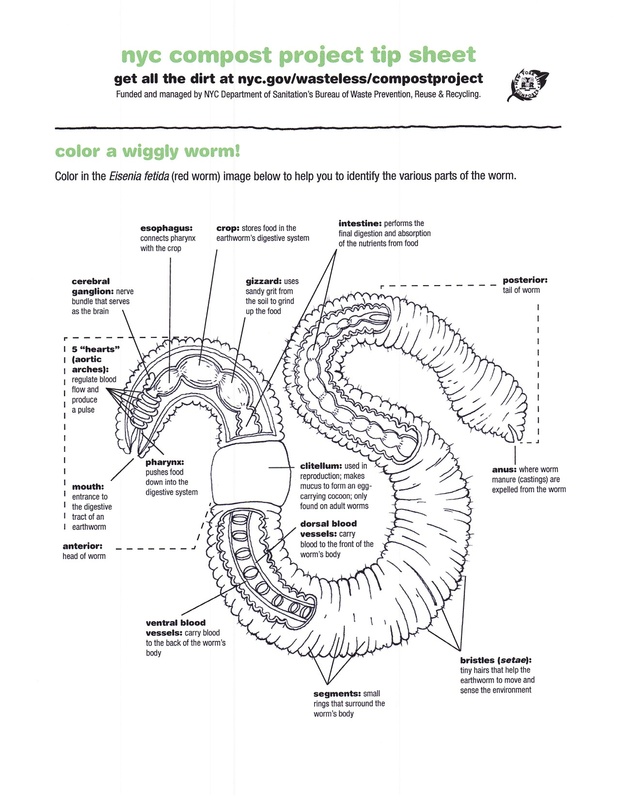 The following are instructions for making, feeding and harvesting a worm bin, taken in large part and adapted with permission from the Cornell University Waste Management Institute Web page: http://compost.css.cornell.edu/worms/basics.html. 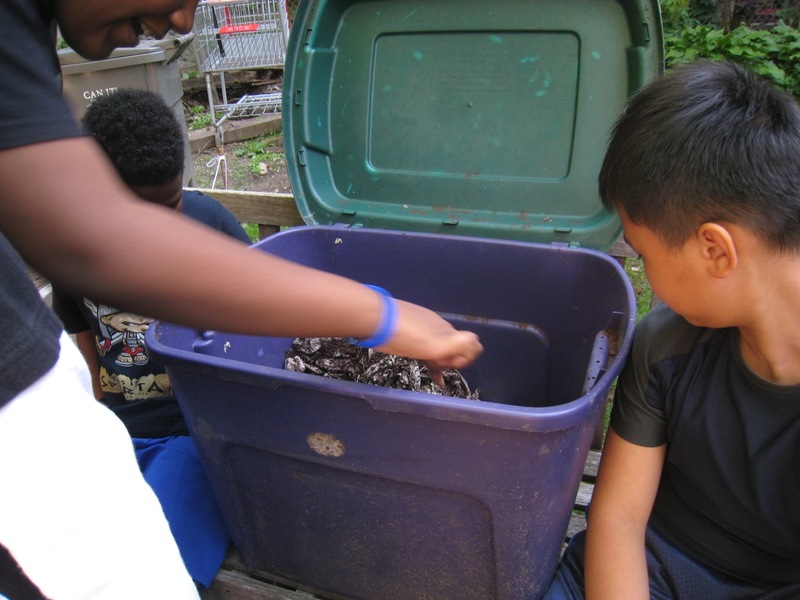 Photos are of Boys Club of New York participants learning about and managing their worm bin during a recent visit to the Children’s Workshop Garden at Campos. Setting up a worm bin is easy. All you need is a box, moist newspaper strips, and worms. To figure out how to set up a worm bin, first consider what worms need to live. If your bin provides what worms need, then it will be successful. Worms need moisture, air, food, darkness, and warm (but not hot) temperatures. Bedding, made of newspaper strips or leaves, will hold moisture and contain air spaces essential to worms. 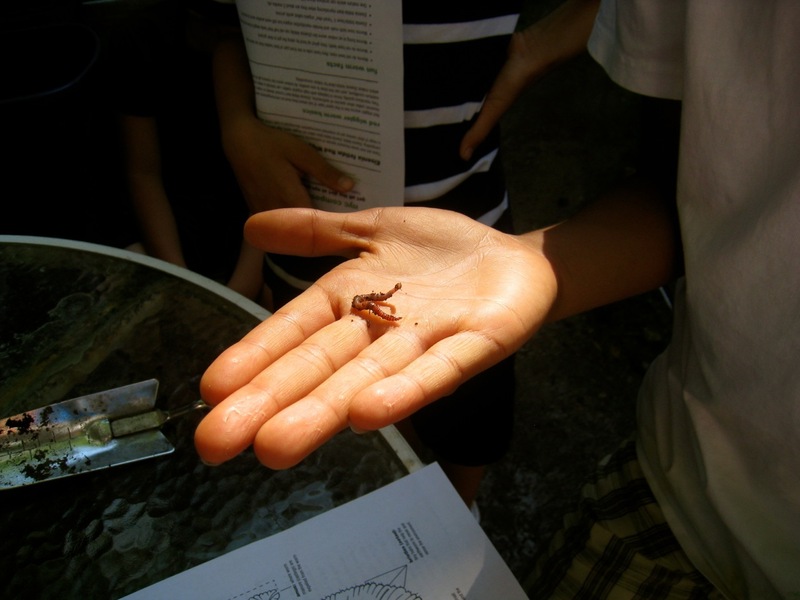 You should use red worms or red wigglers in the worm bin, which can be ordered from a worm farm and mailed to your school. The scientific name for the two commonly used red worms are Eisenia foetida and Lumbricus rubellus. When choosing a container in which to compost with worms, you should keep in mind the amount of food scraps you wish to compost, and where the bin will be located. A good size bin for the classroom is a 5- to 10- gallon box or approximately 24″ X 18″ X 8″. The box should be shallow rather than deep, as red wigglers are surface-dwellers and prefer to live in the top 6″ of the soil.. Whether you choose a plastic, wooden or glass container to use as a worm bin is a matter of personal preference based primarily on what is available. Some teachers have extra aquariums available. Some have wooden boxes which they would like to reuse. Others may prefer to buy or reuse a plastic container, such as commercially manufactured storage bin (e.g. “Rubbermaid,” “Tucker,” “Sterilite”). No matter what material you choose, make sure to rinse out the container before using. For wooden bins, line the bottom with plastic (e.g. from a plastic bag or old shower curtain). Cover the bin with a loose fitting lid. This lid should allow air into the bin. Though worms could eat any organic material, certain foods are better for a worm bin. 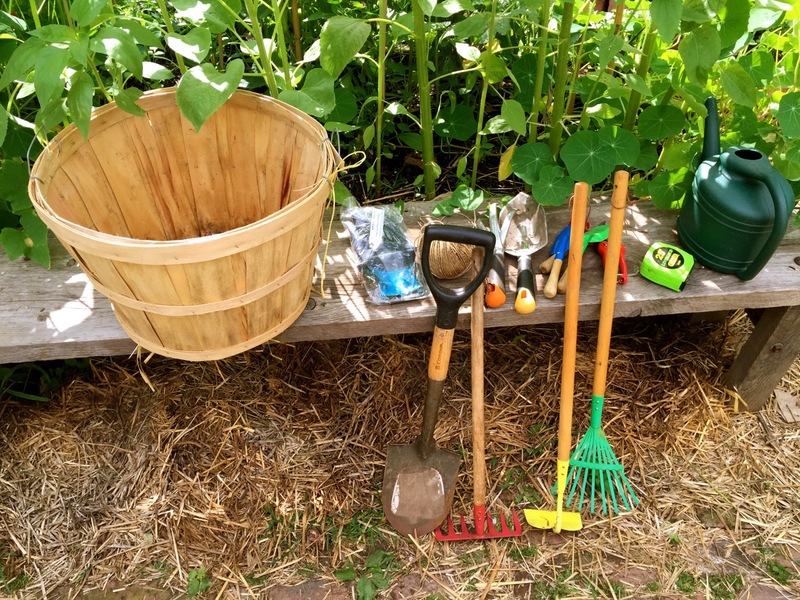 The best materials to add to a worm bin are washed fruit and vegetable scraps, coffee grounds and filters, tea bags (remove the staples), egg shells, paper napkins and towels, and dead plants and flowers. Remember to feed worms a varied diet. Avoid orange rinds and other citrus fruits, which are too acidic, and can attract fruit flies. Try to use a variety of materials. We have found the more vegetable matter, the better the worm bin. You can feed your worms small amounts every day or give them their whole week’s food supply at one time. Large items, such as broccoli stalks, should be cut up, though you may want to avoid broccoli altogether, along with onions unless you don’t mind their strong odor. Move some bedding aside and add your food scraps. Then, cover the food with bedding. Each time you feed the worms, bury the food scraps in a different part of the bin. Bury the food scraps well underneath the newspaper or other bedding material you are using. Do not leave food scraps exposed on top of the bin. Covering the food scraps with bedding is the easiest way to avoid having a fruit fly problem! We recommend using only raw fruit and vegetable scraps. Stay away from meats, oils and dairy products, which are more complex materials than fruits and vegetables. Thus, they take longer to break down and can attract pests. Cooked foods are often oily or buttery, which can also attract pests. If you take care of your worms and create a favorable environment for them, they will work tirelessly to eat your “garbage” and produce compost. As time progresses, you will notice less and less bedding and more and more compost in your bin. After 3-5 months, when your bin is filled with compost (and very little bedding), it is time to harvest the bin. Harvesting means removing the finished compost from the bin. After several months, worms need to be separated from their castings which, at high concentrations, create an unhealthy environment for them. Push all of the worm bin contents to one half of the bin, removing any large pieces of undecomposed food or newspaper. Put fresh bedding and food scraps in empty side of bin. Continue burying food scraps only in freshly bedded half. Over the next 2-3 weeks, the worms will move over to the new side (where the food is), conveniently leaving their compost behind in one section. When this has happened, remove the compost and replace it with fresh bedding. To facilitate worm migration, cover only the new side of the bin, causing the old side to dry out and encouraging the worms to leave the old side. You may continue to compost your food scraps after harvesting. Just add fresh bedding and food scraps. If, for some reason, you do not want to continue composting, please offer the setup to another teacher or to someone who will take the worm bin home. Anyone with a garden will find the worm compost extremely valuable. As a last resort, if you cannot find anyone who wants good worm compost, you may add the worms to a garden bed. You can use your compost immediately, or you can store it and use it during the gardening season, or whenever. The compost can be directly mixed with your potting soil or garden soil as a soil amendment, which helps make nutrients available to plants. Or, the compost can be used as a top dressing for your indoor or outdoor plants. 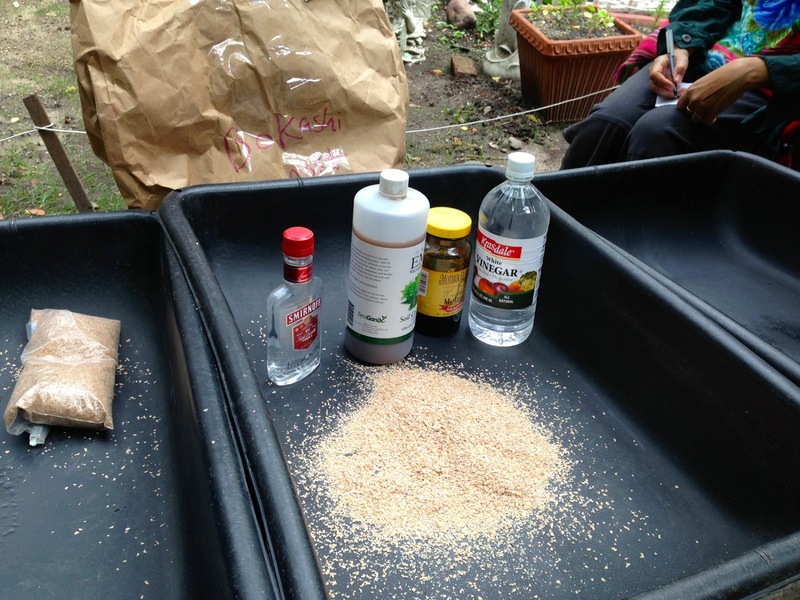 You can also make “compost tea” with your compost. Simply add 1-2″ of compost to your water can or rain barrel. 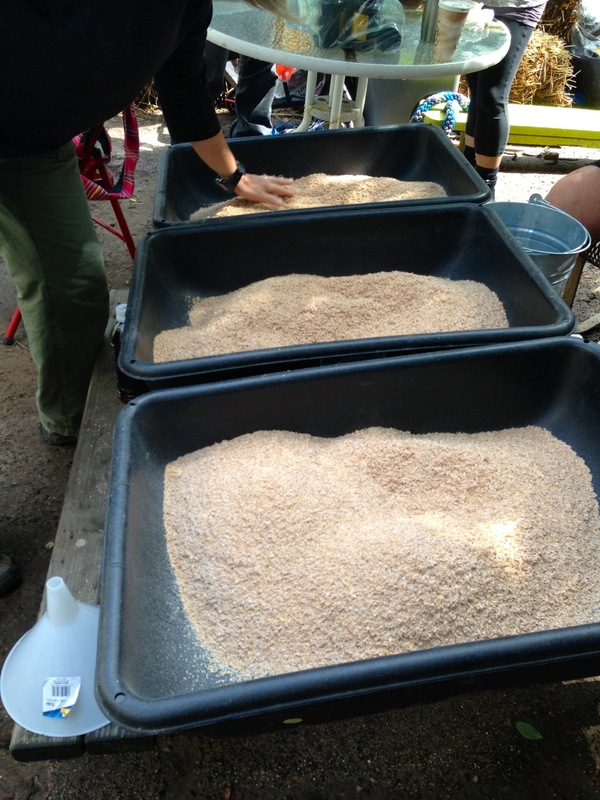 Allow compost and water to “steep” for a day, mixing occasionally. Then water plants as you normally would. 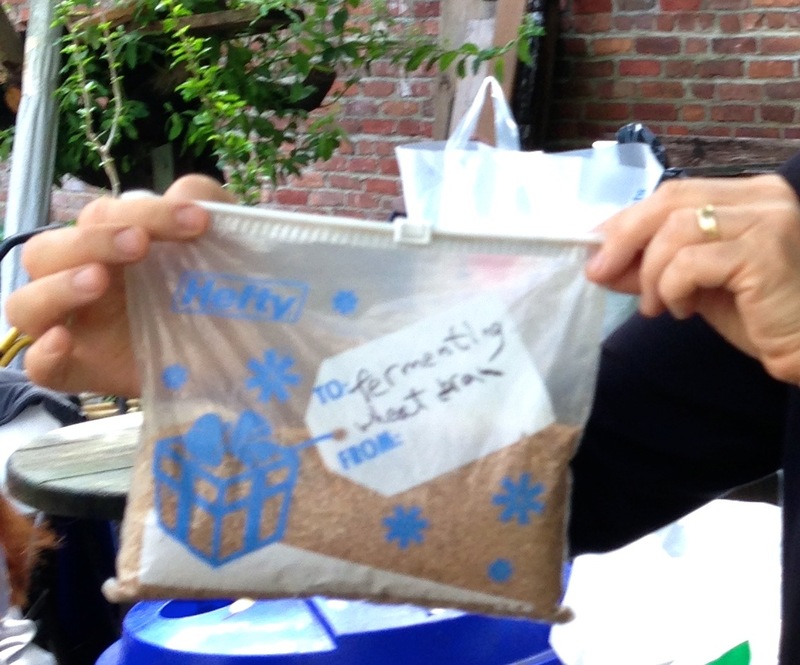 The resulting “tea” helps make nutrients already in the soil available to plants. 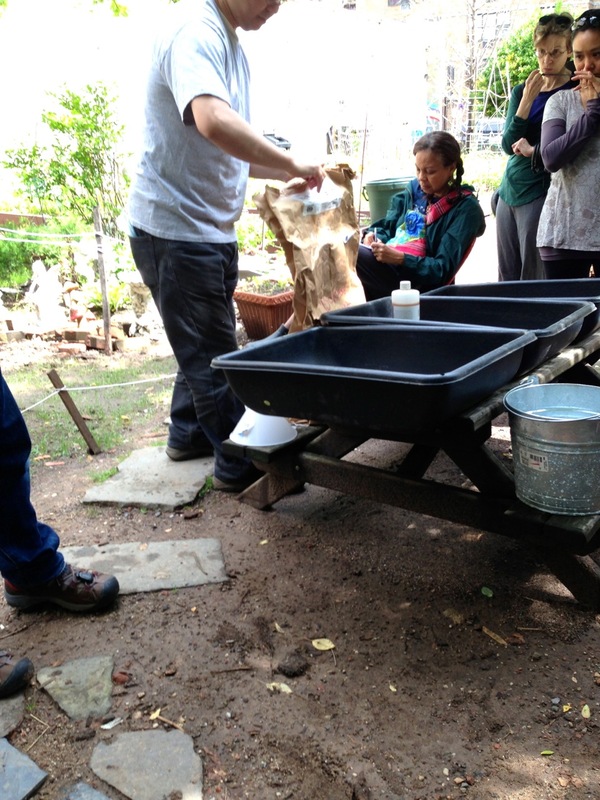 The adults at Campos Garden got their own class in the bokashi fermentation with the famous Shig Matsukawa of Recyclefoodwaste.org. 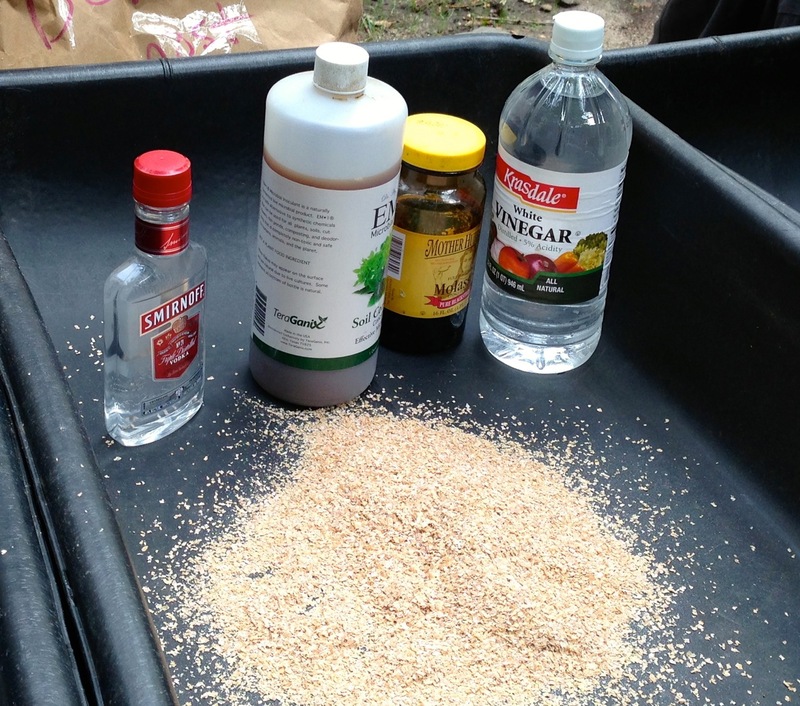 In an upcoming post, we’ll give you instructions on how to create a bokashi fermentation system in your apartment or yard. I live in Harlem and am interested in starting Bokashi composting. Do you know of any place in my area where I can drop off my compost when it’s ready to be buried? Thanks for your question. I asked Shig Matsukawa, who helped us set up our bokashi–here’s his answer. 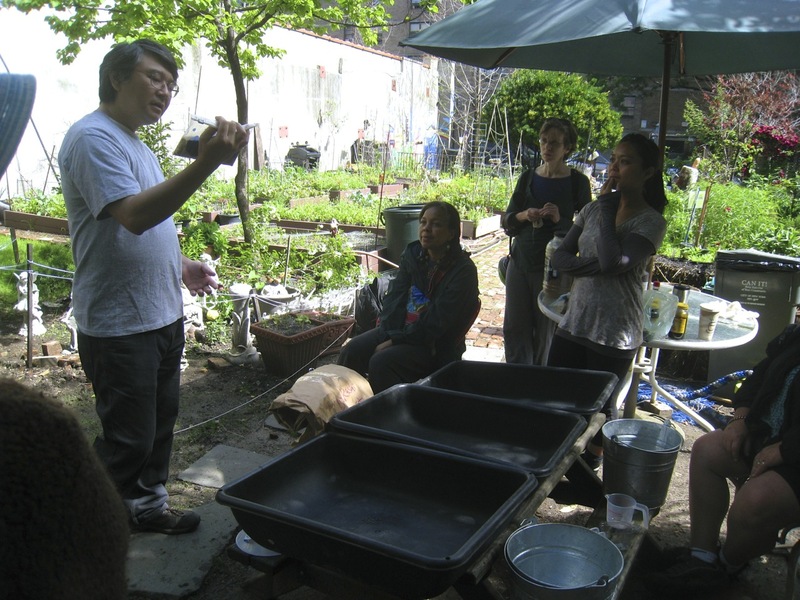 “I do not know of anyone in East Harlem doing bokashi composting, but it may not mean there aren’t any—for instance, I heard a couple of years ago that 8 of the 20 composting grant recipients back then were going to do bokashi, but I only knew of 2 or 3 of those 8 grantees. I could try to find out if there are any in East Harlem and get back to you what I find. Otherwise, there’s a group in central Harlem that’s been doing bokashi for several years now. They call themselves the Earth Pickles and are involved with the Carrie McCracken TRUCE Community Garden, on St. Nicholaus Ave, between 117th & 118th St. If Shig does find out if there are any in East Harlem, I will post the answer. Hi and thanks so much for your response! I actually live more in Central Harlem, 138th and Lenox. So I’ll check out the group you recommended and please keep me updated of any more info you find.